If you've done so well with your training that you can easily use the springs that came with your PelvicToner then congratulations! To keep progressing, add more resistance with these adidtional springs. 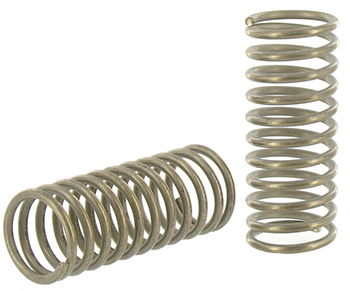 The additional spring set is great for when you feel your vaginal muscles have become too strong for the first set of springs. To squeeze these stronger springs will require more than double the force of the original springs and therefore significantly increase the benefit of the PelvicToner for those who want to increase their vaginal muscle strength.The basic weight lifting principles apply; repetition builds muscle tone and definition, whereas weight (or force) builds strength. Guaranteed to improve your pelvic muscle tone using progressive resistance. As featured on This Morning and in The Times Body & Soul. the PelvicToner is a great way to restore pelvic health and combat bladder weakness, especially after childbirth. The PelvicToner is a simple to use, highly effective patented medical device, that is available on the NHS. The PelvicToner programme uses traditional pelvic floor or Kegel exercises, following the principles set out by Dr Arnold Kegel, the founder of pelvic floor exercise, and takes just 5 to 10 minutes each day. Dr Kegel's exercise programme achieved an 85% cure rate in just a few weeks, and you will see the same level of result and success! It is suitable for women of all ages, and is a simple way to ensure that your squeeze and release exercises are done properly. The PelvicToner is a progressive resistance exerciser which means as your muscles strengthen you can increase the resistance to make it harder to squeeze to achieve even better results.